UPDATE – I often get asked how this is different from the puff stitch. They are very similar with only slight differences. The puff stitch is normally made with dc’s. The ball stitch is hdc’s. The puff stitch is normally a softer to-the-touch stitch, with dc’s in between the stitches (when used). The ball stitch has sc’s between the stitches, which bunches up the ‘ball’ part of the stitch and makes it hard. One of my goals this year is to expand beyond what I already know. I’m comfortable where I am, so it’s time to spread my wings a little and see what else I’m missing. I’m going to try a new stitch every week and will post the stitch and hopefully some pics with my results. 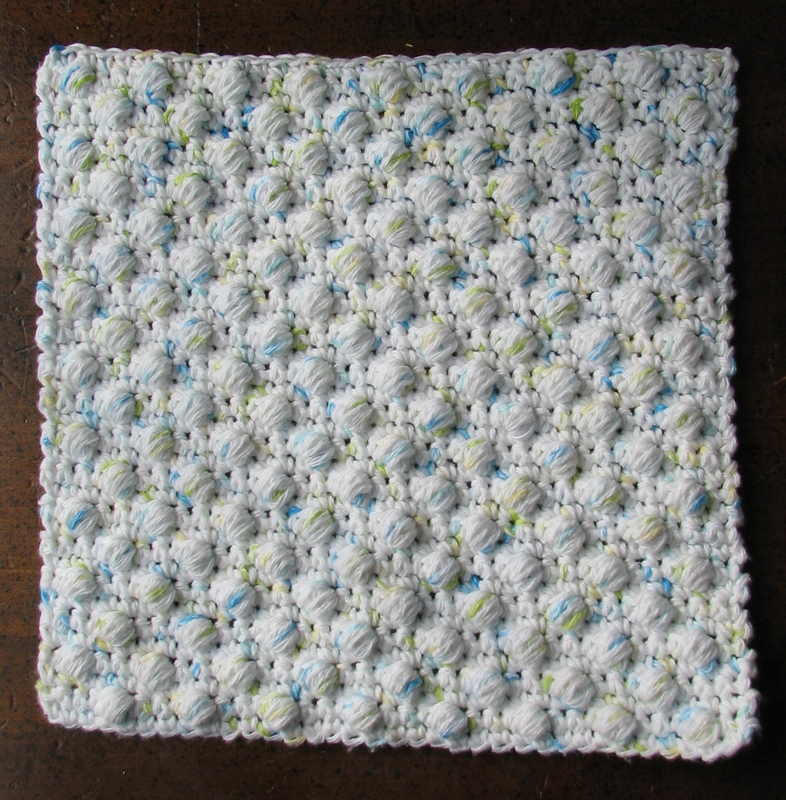 This week I made a dishcloth using the ball stitch. Dishcloths are the perfect size when you’re trying a new stitch. Want to try it before you make a project? Click here for the tutorial of the ball stitch. Little balls crocheted right into the washcloth make it great for scrubbing. Pattern Notes: Ball Stitch (4hdctog) = yo, insert hook into stitch, yo & draw through stitch, repeat 3 more times, yo & draw through all 9 loops leaving one remaining. If you’d like visual help, please see my Ball Stitch Tutorial. Row 2: ch1, sc in 1st 3 sc, *4hdctog all in next stitch, sc in next 3 sc, repeat from * across, turn. Row 3: ch1, sc in each stitch across to end (35 sc), turn. Row 4: ch1, sc in 1st sc, *4hdctog in next st, sc in next 3 sc, repeat from * across, turn. Row 6-37: Repeat Rows 2-5. Fasten off. >What an awesome idea. I am so comfortable with sc, hdc, and dc that I very rarely deviate from them. Learning new stitches sounds like fun. I might have to give this pattern a try. I love the look of it. Thanks! Love it!! I will make a few dishclothes with this pattern, and when I perfect it, I would like to try an afghan…or a baby blanket first.! Does that yarn hold up well? I made 1/2 dozen as a gift to a friend, so I don’t really have an answer. But she said she loves them. That’s about all I know. Sorry. I do use this yarn on hats for my girls and it seems to hold up well for that purpose. Could you please explain 4hdctog to me. I am new to Crocheting and am puzzled by this. Mary, I’ll put up a tutorial on how to do the stitch. It may be easier with pics. I am interested in the tutorial as well. Thanks! Ok, hoping to put the tutorial by Monday at the latest. This is adorable! I’ve been looking for a new Christmas dishcloth pattern, I do believe I just found it! Isn’t it great how excited a 40 something woman can get over a new dishcloth pattern! (: Too much fun! Love this pattern. I would also like to see a tutorial. I am familiar with sc and dc but not the hdc stitch. Thanks. Can other yarns be used instead of Sugar-n-Cream to make a baby blanket or afghan? You should be able to use acrylic, or any other yarn with this stitch. If it’s a different size yarn, just make sure you adjust the hook accordingly. Thanks so much, I am keeping this on my list of patterns to try. Thanks again. Bren. This sounds like a great idea to me too! I’m going to start making some in a variety of colors and then sew them together. I am looking forward to crocheting this, I am making sets of pot holders, hot pads and dishcloths, this should fit right in. Thank you for taking the trouble to add to our crochet knowledge. Thanks for this. What a good idea. I read your brief instructions on making this into a baby afghan can you be more specific on how to turn this into a baby afghan thank you! If you started with 83 stitches you would end up with a finished size of approx. 20″ (this is a guesstimate, I haven’t actually made it to find out the finished size). If you started with 163 your finished size would be approx. 40″. Just keep adding stitches by 4. Ex: I started with 35 stitches. To increase it you would add any number of 4 stitches, until your beginning chain is as long as you want it. 39, 43, 47, 51, 55, 59, 63, 67, 71, etc. Love the looks. This 62 year old granny is adding it!! Love this. It really looks like it would scrub well. Thank you for sharing. Just tried this pattern and I found that you must have a foundation of 36 chains. Instead of 35. With 35 on the 3 rd row on the opposite end the puff is the last stitch instead of the next to last stitch. Makes the fabric uneven. Ok, I’ll remake it and check it out. Thanks. I had the same issue. When I saw this post I went back and tried it again with 36 stitches and it worked perfectly. If I wanted to make a hot pad would I downsize by 4 stitches until my beginning chain was the length (width) I want my hot pad? I absolutely love this pattern, and I am proud to say I did it and it looks like the picture! :) Thank you so much, I was worried when it said intermediate, but then found I really enjoyed it, and it came easy to me, I’m new to “different” stitches. Love it!!! So glad you like it. Thanks so much for the feedback! Your “ball stitch” is nothing more than the well known popcorn stitch. 1) The popcorn stitch is normally made with dc’s. 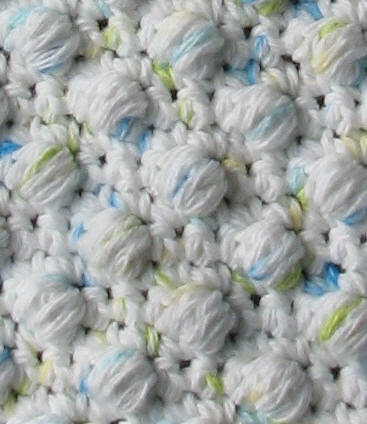 The ball stitch is made with hdc’s. 2) The popcorn stitch is completed by removing your loop from the hook and pulling through a dropped loop. With the ball stitch your loop never leaves the hook. It is completed more like a puff stitch. Hope that clears up the differences for you. Like I said, many stitches have subtle differences. I didn’t make this stitch up, I just made a pattern from it. This looks great. I have just started making dish clothes and had been searching for a variety. Now I have about six patterns . Love yhaving a variety. Will have to give this one a try. I love this one! I think it will be my next project!! My Mom and I just finished this pattern and being long time crocheter’s we both enjoyed the stitch very much. For anyone trying this pattern in the future, save yourself frustration and be very liberal with the counting between the balls and the single crotchet’s. If you want your project to come out exactly like the picture poetic license must be applied. It seems like a too large dishcloth to me. Can I do 18 stitches instead, and still get the pattern? Without actually doing it, I think it would be ch19. They usually shrink a little if you wash and dry them, which is why I did it a little larger. Give it a try and let me know what size it comes out! 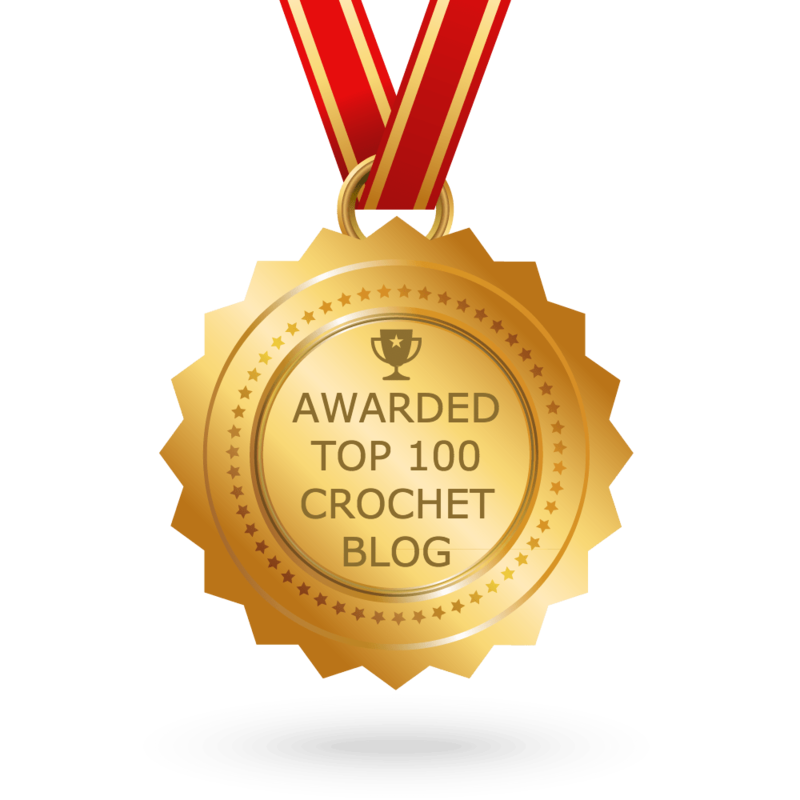 Dear Ambassadorcrochet, I have just stumbled on your site via an other chrochet site and i am absolutly thrilled to the back teeth, i am in Australia and there are not many sites that show you so well chrochet stiches and they certantly do not give patterns away freely. i am so happy as it has been many years since i picked up a chrochet hook and so i am virtually a biginer. your site is well presented and the comments spot is good to read all you loverly ladies helping each othere and your comments ar good well done to all. i am going to try this patteern for the dish cloth and iI hope iI will find more patterns so I have a varity too. i have 1 little grissel and that is your comments page is white and the writing is very pale blue for me very hard to read what i have written. Appart from that this is fantastic. WELL DONE AND THANK YOU..
from Jo Down Under. Yes I am a Member Now. I’m working on trying to fix the font color in the comment box. Thanks for the suggestion, and the compliments. Just finished this project. It turned out fantastic. Thank you. Was looking for something different. I must say I found it and love it! Your tutorial was very easy to understand. Thank you for posting. I’ll be looking at more of your stuff. I am liking this stitch for dishcloths…thanks for the pattern! If you crochet loosly, just use a smaller hook to get the right look, for any pattern. I love sugar n’ cream cotton yarn, also peaches n’ creme. It is all I use when creating potholders and dishclothes. Anything for the kitchen. When it gets wet it stays sturdy enough to scrub even the pots and pans. Thank you so very much for sharing this with us. You are very kind and your kindness is certainly being “paid forward”. This made my day, Faith! Thank you!!! The pattern says it should measure 9.5 “. Obviously my stitches are bigger because mine is 11” which is a little big for a dishcloth. Should I just use a smaller hook next time or can I eliminate four or eight stitches? I love the pattern. I’m going to make a scarf for my niece. You could do either to make it smaller. If you like the drape (stitches aren’t too tight or too loose) then I would say definitely try decreasing by 4 counts. If you feel like it’s loose or even pretty good the gauge it is, then you could go down a hook size. i am finding your stitch count is off. i chain 35, then row 1 i sc across leaving 34 sc,, i chain 1, turned and followed row 2 instructions and am coming up short/extra with this row. then i see you say to make larger it is in 4 count. well 34 doesn’t divide into 4. is there something i did wrong? Hi Joan, it should be chain 36 and then the first row would have 35 sc. I’ve fixed the pattern. Thanks for pointing that out!